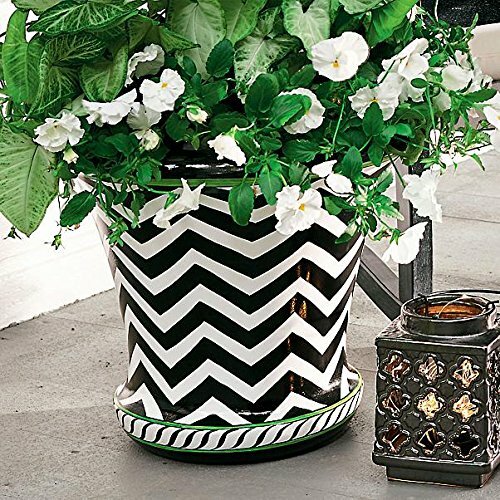 Modern and fun, geometric design planter Handcrafted from lightweight fiberglass and resin Hand painted for the look of ceramic Finished with a durable polyurethane topcoat No two are exactly alike Optional drainage hole Best if displayed in a covered area to maintain original sheen Height: 15" Width: 18"dia. Weight: 6 lbs. Height: 15" Width: 18"dia. Weight: 6 lbs. If you have any questions about this product by Outdoor Collection, contact us by completing and submitting the form below. If you are looking for a specif part number, please include it with your message.